The Assumption has been a subject of Christian art for centuries. This painting is believed to be by Bartolome Murillo. In Roman Catholicism, the Assumption of Mary is an official dogma of the Vatican affirming that the mother of Jesus never actually experienced physical death, and instead entered into Heaven in bodily form accompanied by a host of angels. Roman Catholics believe that Mary was transported into Heaven with her body and soul united. The feast day recognizing Mary's passage into Heaven is celebrated as The Solemnity of the Assumption of the Blessed Virgin Mary by Roman Catholics. This doctrine was defined by Pope Pius XII on November 1, 1950, in his Apostolic Constitution, Munificentissimus Deus. In those denominations that observe it, the Assumption is commonly celebrated on August 15. 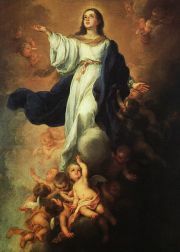 Although the doctrine of the Assumption of Mary may somewhat controversially tend to honor and glorify her more than Jesus because of its assertion that she never experienced physical death, while Jesus actually did, and although it may also cast a question about the nature of physical resurrection, it gives a useful perspective on the uninterrupted continuity of the physical dimension of life beyond earthly life. Although the assumption was only recently defined as dogma, and in spite of a statement by Epiphanius of Salamis (315-403 C.E.) in 377 C.E. that no one knew of the eventual fate of Mary, stories of the assumption of Mary into heaven have circulated since at least the fifth century, although the Catholic church itself interprets chapter 12 of the Book of Revelation as referring to it. The earliest narrative is the so-called Liber Requiei Mariae (The Book of Mary's Repose), a narrative which survives intact only in an Ethiopic translation. Probably composed by the fourth century, this early Christian apocryphal narrative may be as old as the third century. Also quite early are the very different traditions of the Six Books Dormition Narratives. The earliest versions of this apocrypha are preserved by several Syriac manuscripts of the fifth and sixth centuries, although the text itself probably belongs to the fourth century. Later apocrypha based on these earlier texts include the De Obitu S. Dominae, attributed to St. John, a work probably from around the turn of the sixth century that is a summary of the Six Books narrative. The story also appears in De Transitu Virginis, a late fifth century work ascribed to St. Melito of Sardis that presents a theologically redacted summary of the traditions in the Liber Requiei Mariae. The Transitus Mariae ("Passing of Mary") tells the story of the apostles being transported by white clouds to the death-bed of Mary, each from the town where he was preaching at the hour. However, "Pope Gelasius condemned the book (De Transitu Virginis Mariae Liber) as heretical in the year 494." An Armenian letter attributed to Dionysus the Areopagite also mentions the event, although this is a much later work, written sometime after the sixth century. Other saints also describe it, notably St. Gregory of Tours, St. John Damascene, and St. Modestus of Jerusalem. In some versions of the story, the event is said to have taken place in Ephesus, in the House of the Virgin Mary, although this is a much more recent and localized tradition. 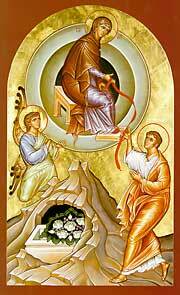 The earliest traditions all locate the end of Mary's life in Jerusalem. By the seventh century, a variation emerged, according to which one of the apostles, often identified as St Thomas, was not present at the death of Mary, but his late arrival precipitates a reopening of Mary's tomb, which is found to be empty except for her grave clothes. In a later tradition, Mary drops her girdle down to the apostle from heaven as testament to the event. 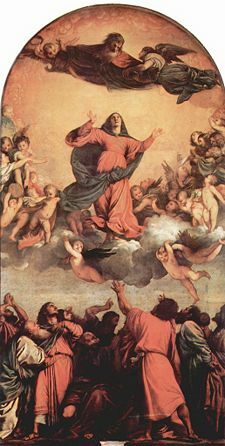 This incident is depicted in many later paintings of the Assumption. Theological debate about the Assumption continued until 1950, when it was defined as definitive doctrine by Pope Pius XII: "[…] We pronounce, declare, and define it to be a divinely revealed dogma: that the Immaculate Mother of God, the ever Virgin Mary, having completed the course of her earthly life, was assumed body and soul into heavenly glory." It is important to note that the Roman Catholic Church does not recognize the apocryphal accounts as having any authority. It does not base its teaching about the Assumption on them but rather on theological reasons. In his Fundamentals of Catholic Dogma, Lutwig Ott states that "the fact of her death is almost generally accepted by the Fathers and Theologians, and is expressly affirmed in the Liturgy of the Church," to which he adduces a number of helpful citations, and concludes that "for Mary, death, in consequence of her freedom from original sin and from personal sin, was not a consequence of punishment of sin. However, it seems fitting that Mary's body, which was by nature mortal, should be, in conformity with that of her Divine Son, subject to the general law of death." The point of her bodily death, however, has not been infallibly defined, and many believe that she did not die at all but was assumed directly into Heaven. Indeed, the papal decree that infallibly proclaims the doctrine of the Assumption, the Apostolic Constitution Munificentissimus Deus, leaves open the question whether, in connection with her departure, Mary underwent bodily death; that is, it does not dogmatically define the point one way or the other, as shown by the words "having completed the course of her earthly life." The Assumption is important to many Catholics as the Virgin Mary's heavenly birthday (the day that Mary was received into Heaven). Her acceptance into the glory of Heaven is seen by them as the symbol of the promise made by Jesus to all enduring Christians that they too will be received into paradise. Possibly the most famous rendition of the subject in Western art, Titian's Assunta (1516-18). This day is marked by the Feast of the Assumption and is a Public Holiday in many countries, including Austria, Belgium, Cameroon, Chile, France, Italy, Lebanon, Luxembourg, Malta, Paraguay, Poland, Portugal, Spain, and Vanuatu. In Guatemala, it is observed in Guatemala City and in the town of Santa Maria Nebaj, both of which claim her as their patron saint. Also, this is the celebration of Mother's Day in Costa Rica. In many places, religious parades and popular festivals are held to celebrate this day. In Anglicanism and Lutheranism, the feast is kept, but without official use of the word "Assumption." Her feast day is Fête Nationale of the Acadians, of whom she is the patron saint. Businesses close on that day in heavily francophone parts of New Brunswick, Canada. The Virgin Assumed in Heaven is also patroness of the Maltese Islands and her feast, celebrated on August 15, apart from being a public holiday in Malta is also celebrated with great solemnity in all the local churches. The Roman Catholic Feast of the Assumption is celebrated on August 15, and the Eastern Orthodox and Eastern Catholics celebrate the Dormition of the Theotokos (the falling asleep of the Mother of God) on the same date, preceded by a 14-day fast period. Eastern Orthodox Christians believe that Mary died a natural death, that her soul was received by Christ upon death, and that her body was resurrected on the third day after her death and that she was bodily taken up into heaven in anticipation of the general resurrection. Her tomb was found empty on the third day. …Orthodox tradition is clear and unwavering in regard to the central point [of the Dormition]: The Holy Virgin underwent, as did her Son, a physical death, but her body—like His—was afterwards raised from the dead and she was taken up into heaven, in her body as well as in her soul. She has passed beyond death and judgment, and lives wholly in the Age to Come. The Resurrection of the Body … has in her case been anticipated and is already an accomplished fact. That does not mean, however, that she is dissociated from the rest of humanity and placed in a wholly different category: For we all hope to share one day in that same glory of the Resurrection of the Body which she enjoys even now. The Prayer Books of the Scottish Episcopal Church and the Anglican Church of Canada mark August 15 as the "Falling Asleep of the Blessed Virgin Mary." Anglo-Catholics often observe the feast day under the same name as Roman Catholics. In the Episcopal Church, August 15 is observed as the commemoration "Of the Blessed Virgin Mary," and the recent Anglican-Roman Catholic agreed statement on the Virgin Mary assigns a place for both the Dormition and the Assumption in Anglican devotion. If the Roman Catholic Church believes that Mary never experienced physical death, while Jesus actually did, then it probably ends up honoring and glorifying her even more than him, whether it likes it or not. So, Ludwig Ott's more flexible statement as a Roman Catholic theologian, which tends to admit of her physical death and which therefore is closer to the Eastern Orthodox view, may deserve appreciation from a reasonable point of view, which would hesitate to honor Mary more than Jesus the Savior. Another issue concerns the nature of the body of Mary after the Assumption. If she did not experience physical death at all, then it would very likely mean that when she went to Heaven at the Assumption, she carried with her exactly the same body that she had on earth. Again, this ends up differentiating between Mary and Jesus, because Jesus' resurrected body is generally understood not to be exactly the same body that he had on earth but rather an "imperishable," "glorified," and "spiritual body" according to St. Paul (1 Corinthians 15:42-44). However, the doctrine of the Assumption of Mary can be taken more positively to mean that saintly humans such as Mary (and even every other human) can hope for their physical as well as spiritual dimensions of life uninterruptedly beyond their course of earthly life, although how the physical dimension of life beyond earthly life continues may still be subject to interpretation. For example, the interpretation of scholars such as W.D. Davies is that the physical dimension of life after earthly life is uninterrupted because one is physically resurrected with a spiritual kind of body immediately upon the completion of earthly life. Again, what is interesting about the Assumption of Mary is that she was never interrupted by the so-called "intermediate state" in which one would be without a physical body, just awaiting physical resurrection in the last days. ↑ Pope Pius XII, "Munificentissimus Deus—Defining the Dogma of the Assumption." Retrieved September 30, 2007. ↑ Panarion, 78.11, (GCS 37 [Epiphanius 3], 462); cf. Daley, Dormition, 5-7. ↑ University of Dayton, The Vision of the Apocalypse. Retrieved February 28, 2008. ↑ Stephen J. Shoemaker, Ancient Traditions of the Virgin Mary's Dormition and Assumption. Oxford ; New York : Oxford University Press, 2002. ISBN 0199250758 ISBN 9780199250752. A complete translation of this earliest text appears at pp. 290-350. ↑ William Wright, The Departure of my Lady Mary from this World. Retrieved September 30, 2007. ↑ Lionel Smithett Lewis, St. Joseph of Arimathea at Glastonbury or the Apostolic Church of Britain. (Kessinger Publishing, LLC, 2003). ↑ Ante-Nicene Fathers, The Writings of the Fathers Down to A.D. 325. Retrieved September 30, 2007. ↑ Apostolic Constitution Munificentissimus Deus, No 44. Retrieved September 30, 2007. ↑ W. D. Davies, Paul and Rabbinic Judaism (SPCK, 1955). Duggan, Paul E. 1989. The Assumption Dogma: Some Reactions and Ecumenical Implications in the Thought of English-speaking Theologians. Cleveland: Emerson Press. Lewis, Agnes Smith, ed. Apocrypha Syriaca, Studia Sinaitica, XI. London: C. J. Clay and Sons, 1902. Wright, William. "The Departure of my Lady Mary from this World," The Journal of Sacred Literature and Biblical Record, 6 (1865): 417-48 and 7 (1865): 108-60. History of "Assumption of Mary"
This page was last modified on 21 April 2016, at 15:57.